The 11th International Liquid Glass Training will take place in Cologne (Köln) / Germany on May 14th/15th, 2018; and participants from 17 countries have already confirmed that they are participating. Register now for one of the very last places of the most significant conferences in this industry / technology. All information and registration here. CCM GmbH from Overath in Germany has won the “Innovation Award-IT”, for the fourth time. Our new award relates to our latest offering, this being “Long-Term Disinfection for Smartphones”. This specially developed disinfection technology protects smartphones for 24 hours per day, 7 days a week, when applied as directed.The transmission of pathogens (eg. bacteria, viruses and fungi) via smartphones, undoubtedly affects the health of the user. The high levels of phone contamination is well documented. 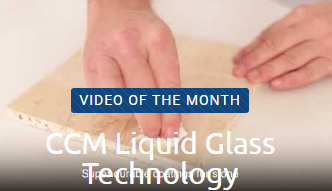 A new video about our unique Liquid Glass Technology is online. PLMA Show takes place in Amsterdam between 29.-30. 05.2018. We have chosen not to have a dedicated stand this year but we would welcome the opportunity to meet with you at the venue, and so please arrange a fixed meeting with us. Official Homepage of the show.